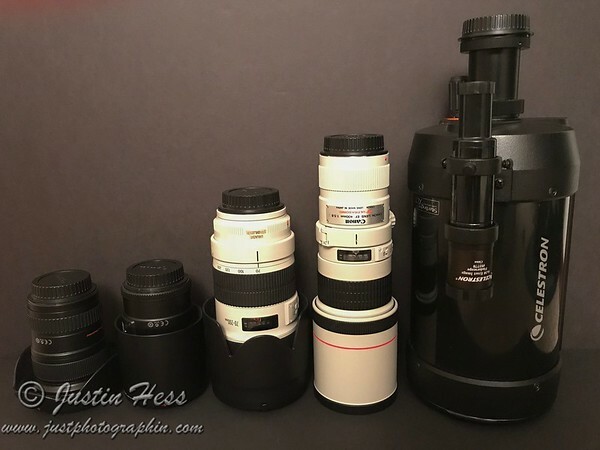 As I was beginning to get more serious about photography, I started asking other photographers for advice about equipment. I looked at what they were using and tested out different camera bodies from different manufacturers. There was one piece of advice that I heard several times: get good lenses (often referred to as glass). I am glad I followed this advice, and have reciprocated the advice to other folks who ask me about equipment. There are several reasons why I think it is important to get good quality glass. The lens is what actually creates the image. A high-end, expensive camera with the best sensor only captures what it is seeing through the glass that is placed in front of it. Meaning, if the quality of the lens is poor, the image will be poor regardless of how good the sensor in the camera may be. Lenses can have different specifications. They can be wide-angle, normal, or telephoto. This changes the perspective of what the lens can see. Some lenses can zoom between focal lengths to change the angle of view more quickly without having to change the lens. Other lenses have a fixed focal length (referred to as prime lenses). There are fast lenses and slow lenses, which is a reference to the aperture of the lens and how much light it will let pass through to the sensor. Wide-angle lenses are lenses that see a greater angle of view from side to side. They are lenses with focal lengths less than 50mm. I have a 16-35mm super wide-angle zoom lens that I use for landscapes and astrophotography. It is also a fast lens with a f/2.8 aperture that lets in a lot of light for low light situations. Normal lenses are typically 50-85mm. These are good for portrait photography. I do not take many portraits. However, I know a lot of portrait photographers who use something in this range. People are rendered nicely by these focal lengths. Telephoto lenses are going to range anywhere between 70-400mm. I use a 70-200mm zoom lens for portrait work as well as some wildlife and landscape photography. This is my go to lens if I want to carry one lens that will cover a wide range of possible distances. I tend to get more questions with this lens, as well. Longer lenses tend to attract more attention. Last year, I added a spotting scope to my lenses. It is a 1250mm focal length, f/10 aperture, Celestron C5 spotting scope. Again, people migrate toward me when I am using this lens. It is unique for photography, and offers a slightly different perspective. Lenses impact the photographs that can be created. My challenge for this week is: take a look at the lens. Find out what the technical specifications are: what is the focal length of the lens? What is the aperture range? Is it a prime lens or zoom lens? Next week, I will be going more in depth about aperture with a video to demonstrate how it works. ← What is the Subject?